The street markets of London are renowned around the world. Having a wander around the markets is a great way to spend a few hours in London without spending any money – unless you want to, of course! The markets of Camden attract more than 100,000 visitors each and every weekend. The streets of Camden are well known for their unique clothing from independent designers. Camden is always busy because many locals and tourists choose to hang out there. Sunday is generally considered to be the busiest and best day, but there is still plenty going on during the week. If you want to avoid the crowds, it is recommended that you visit during the week, but be aware that certain stalls are not open throughout the week. The markets are open until 6pm every night of the week. Portobello Road is home to one of the most famous street markets in the world. It is located in the area of Notting Hill. The area is an interesting place to shop due to not only the markets, but the street itself. There are a number of well-known shops on the high street, most of which are independent. Fans of the film Notting Hill may be interested in going on a self-guided tour of the main film locations in the area. 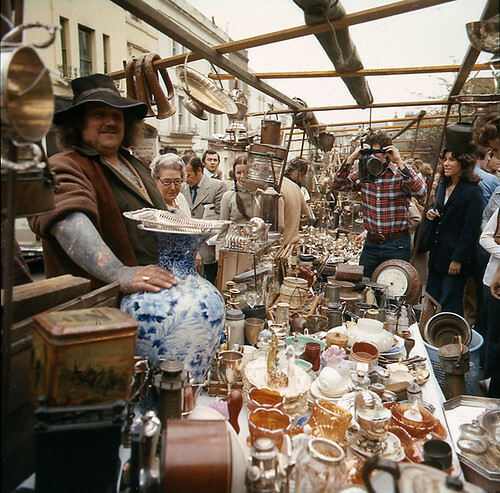 Portobello Road is well known for its antiques market every Saturday. Brick Lane flea market takes place every Sunday, selling anything you could possibly want to find, ranging from vintage clothing, music, furniture to fruit and veg. Brick Lane is a cultured place which is home to a large Bangladeshi community and also well known for its Jewish community. Those interested in dining around Brick Lane will find some of the best curry restaurants in London in the area. If you’re interested in visiting Greenwich market, head there between Thursday and Sunday. The market sells rate antiques, gifts and arts. Weekdays tend to be quitter than Saturdays and Sundays. Those who are interested in British history may be intrigued to find that the area is a hotspot for royal history. Henry VIII was born in Greenwich, later followed by the birth of his daughters Elizabeth I and Mary I. You will find plenty of one of a kind items in Greenwich market because the managers of the market prioritise those who design their own products. Priority is also given to importers of specialist ethical goods from abroad. Another market which history fans may appreciate is Old Spitalfields. The market dates back to the 1600s when it was licensed by King Charles. Surrounding the market is a number of independent shops that sell handmade goods, fashion and gifts. The shops are open throughout the week. The great thing is, it is covered so your day won’t be ruined during wet weather. Yu will find that the busiest day of the week is Sunday, so depending on how much you like the crowds you may want to avoid that day. Olivia Lazenby is a well known author of all things travel and tourism related. Olivia often visits www.thamescruise.co.uk to get the latest information on rivers cruises on The River Thames.